Combine meat, breadcrumbs, milk, eggs, 1/4 cup brown sugar, and pepper in large bowl. Mix just until blended. 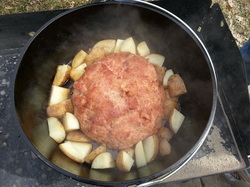 Shape into loaf in center of prepared Dutch oven. Mix remaining 1 cup of brown sugar and 1/3 cup of Sprite for glaze. 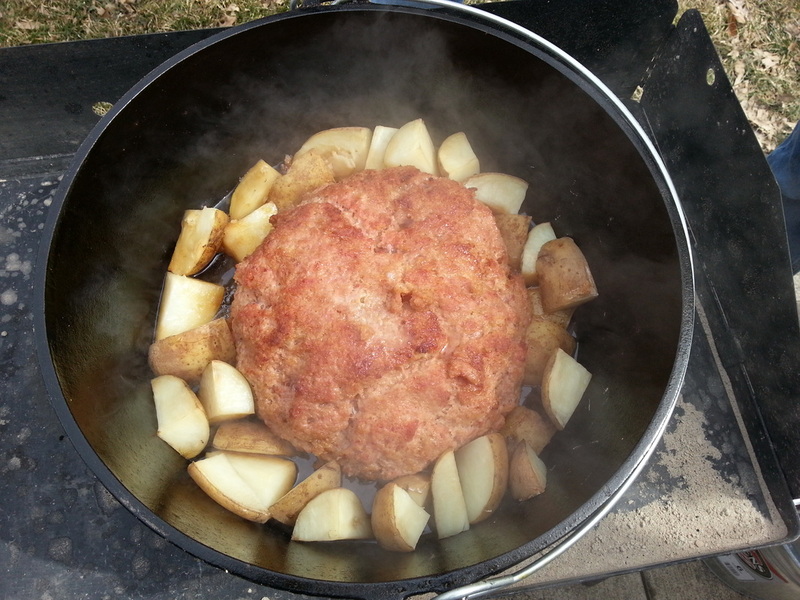 Cut potatoes into quarters and outline hamloaf with pieces. Pour glaze over all contents. Use 10 coals around the base of the oven and 18 to 20 on the lid. After 30 minutes move the center coals to a double ring around the outside of the lid. Bake at 375 degrees for 60 minutes until done or until internal meat temperature reaches 160 degrees. Spoon glaze over hamloaf and serve.